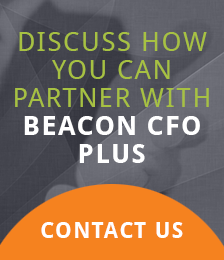 BeaconCFO Plus provides part-time recurring CFO services to small- and medium-sized companies that need an experienced CFO, but either don’t have the budget or the need to commit the resources required for a full-time CFO. Every small-business owner faces many challenges that can only be best resolved with the help of a seasoned financial and operational resource. The strategic guidance our CFOs provide is invaluable, especially when assisting companies that are rapidly growing or require restructuring to accommodate a downturn in business. The absence of the performance metrics required to accurately measure business health. The inability to meaningfully connect margins, cash flow and working capital requirements to sales and net income. An insufficient structure to develop, monitor and continually update the company’s strategic plan/vision. Often, the culprit of these issues is the company’s lack of time—owners are constantly pulled in many directions and only able to react, which means they address only their most immediate problems at the expense of properly planning for the future of their organization. Supporting and guiding the development of strategic operating plans. Your company will immediately benefit from our CFO’s ability to quickly establish performance metrics that help measure key business drivers. Additionally, our CFOs quickly become advocates for your profitability by better defining processes and procedures that will result in operating efficiencies. Our first goal is always to establish predictable, repeatable behaviors that enhance your company’s value. But we understand that every company’s financial and operational management needs are unique. You can be sure that with BeaconCFO Plus you’ll have access to part-time CFO services that are delivered in a flexible manner and dedicated to one outcome—the success of your company.